Direct-Attached Storage (DAS): Direct-attached storage is as it sounds, storage attached directly to the server, either internal to the server or external. Common protocols include SATA (and eSATA), SCSI, and SAS. Direct-attached storage is most often used when a single DVR/NVR or server is used for recording, with internal drives. If a longer retention period is needed, eSATA or SCSI expansion units are used. Network-Attached Storage (NAS): Network-attached storage consists of an appliance loaded with a hard drive or hard drives, which resides on the network, not attached directly to the recorder. The NAS's drive or drives may be mounted as network drives, though some NASs actually provide iSCSI services, acting as a SAN, as well. Storage Area Network (SAN): The term SAN refers to more than just a storage unit, but this use has been commonly accepted. A SAN is a network, either dedicated or shared, which is used for the transmission of storage data. It differs from NAS in that a NAS device contains an operating system, and may perform other functions, while a SAN is simply used for raw storage. iSCSI is the most common SAN protocol. SANs are most often used when multiple recording servers are used, since they are typically extremely scalable, sometimes in the petabyte range. This makes data from multiple recorders stored on a single SAN simpler to manage than individual drives in numerous servers. Edge Storage: This method refers to storage contained in the camera itself, either on flash or hard drive storage. This is not commonly used today but is seen by many as a potential big future option. 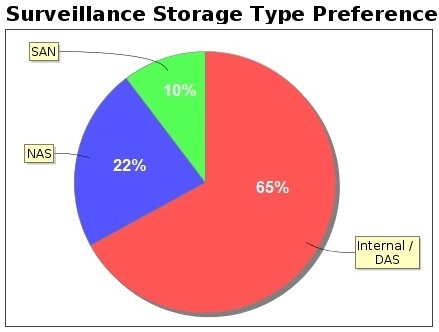 Nearly two-thirds (65%) preferred internal or direct-attached storage. Overwhelmingly, the reason given for this preference was that DAS was easier and simpler to deploy, and more reliable, with less to troubleshoot. Both of the other options require more network configuration and setup than simply using storage directly connected to the server. Additionally, since the network is an added variable, troubleshooting becomes more complex. "Easy conmfiguration and turn on for most small jobs." "Easy to manage within the VMS. Most solutions we have used so far have been all-in-one." "A vast majority of our camera systems run on one or two servers. For those it's easier and cheaper to utilize internal drives instead of a SAN. If the customer already has a SAN then it can be cost effective." "Direct storage is fast, easily configurable, and easily managed. NAS/SAN fabrics are easily attached to VMSs, but often represent a 'second choice' if Direct Attached storage is not otherwise configurable or available." "For simplicity and size. Most servers have been configured to hold sufficient internal storage. I do see that changing over time as image quality and retention increase"
NAS (22%) and SAN (10%) storage were second and third in our results, totaling up to about one-third of all responses. Note that in examining these results, we combined these two technologies, as there seemed to be confusion between these two terms, with some respondents using them interchangeably. Further, while there are differences between NAS and SAN devices, there is now some overlap, with some NASs able to act as SANs using iSCSI protocol. We therefore found it best to look at these two options together. A variety of reasons were given for choosing NAS and SAN, though most common were reliability and scalability. Network-based storage may have an advantage in case of server failure. Since the storage remains in place, a new server may be brought in and configured, and continue recording to the same location as the original server. "Solid network storage for enterprise customers that is fault-tolerant and allows for immediate recovery of sensitive customer information. Critical to most of our customers is storage that is consistent. Additionally, the only SAN architecture we use allows for serverless computing which decreases footprint for our customers. Invariably, most of our customers have indicated a need to work beyond the "borders" of the physical security and therefore integration into the central IT architecture is critical. As most enterprise storage solutions are either FC or SAN, we have chosen to use SAN as the primary." "The ability to have the storage physically anywhere on the LAN as well as distribute the load adds to system scalability and reliability"
"I like a unit that is stand alone from other network parts. I also like the NAS can be monitored with network monitoring tools that my IT customers and my technicians are use to using." "Easy to service and maintain with storage in a central location or distributed in a few locations if necessary." "NAS is a very mature technology, cost effective, scalable and easy to manage"
Two comments also touched on the benefit of using NAS storage to protect against theft. In small systems, if a thief were to make off with the PC being used for recording, all video evidence will be lost. "It can be hidden away anywhere and have good backup options." "We are used to having NAS in our CCTV's storage so its easy to hide them anywhere. In one case we hid the NAS near the compressor of an refrigerator, since the costumer had a robbery where the PC was stolen also, so no VIDEO recordings were left"
"I prefer storage on the camera because it reduces of risk of video loss on a large scale. I believe the cost of ownership is less, and it is much easier to scale the retention requirements when adding additional cameras when the storage is on the edge." Respondents preferring other solutions also commented on the concept of edge storage, stating that they didn't feel it was ready for enterprise use today, but expected to see it in the next few years. When reviewing these results, surprisingly, system size did not play a major factor. Some may expect to see very small systems jump to near 100% DAS preference, and a higher preference for SAN storage among large systems. However, the distribution of responses remains about the same across all system sizes. Also surprising, responses were close, within a margin of error, between those deploying a majority of analog cameras vs. those deploying a majority of IP cameras. While there are no similar surveys from the past, our gut feel is that the percentage choosing network based storage has risen considerably over the last five years. In 2012, it is nearly 1/3rd of respondent's favorite but we would be surprised if it was more than 10% in 2007. Internal / Direct storage may still be the overall favorite but it is clearly under attack by network storage. Going forward, in the next 5 years, we expect Internal / Direct storage to fall into the minority of integrator favorites. The two biggest threats look to be NAS devices and on board storage. NAS devices offer a very low cost way to get more than enough storage for the average surveillance deployment. Storage on board cameras is getting to the point where SD card costs are reasonable for moderate duration surveillance storage and VMS support is becoming available.